Smog and outdoor air pollution are (sadly) becoming more common to visibly identify, whether it’s hanging over the skyline of a city, being emitted from the vehicle in front of you, or puffing out from a refinery. It’s easy to associate thick, hazy air as being unhealthy — and maybe there are even days you avoid or postpone outdoor activity due to air quality levels. But visibility alone isn’t the only indicator of poor air quality. In fact, indoor air quality — even the air inside your own home — can be anywhere from 2 – 5 times worse than outdoor air, according to the EPA. Prashant Kumar of the University of Surrey is the co-author of an air pollution study published in the journal Science of the Total Environment. He told CNBC, “When we think of the term ‘air pollution,’ we tend to think of car exhausts or factory fumes expelling gray smoke. However, there are actually various sources of pollution that have a negative effect on air quality, many of which are found inside our homes and offices. From cooking residue to paints, varnishes and fungal spores, the air we breathe indoors is often more polluted than that outside.” According to CNBC, Kumar’s previous research in the field showed that buildings near traffic intersections had substantially higher levels of pollutants indoors. Although the statistics can skew a bit differently for people who live in rural locations, people who live in cities spend up to 90% of their time indoors. For city dwellers, researchers have noted that in some cases, their indoor air is quite similar to outdoor air, especially in well-ventilated buildings. For those with allergies and asthma, environmental triggers aren’t always located outside. 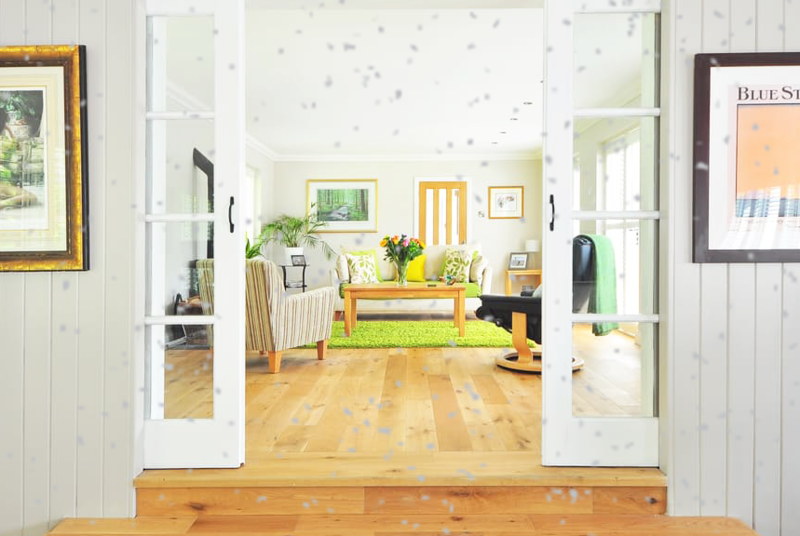 While problematic allergens like pollen are mainly found outdoors, they and other pollutants can also easily migrate indoors, and — due to the efficient (read: airtight) design of modern homes and buildings — those pollutants are likely to stay stuck once they make their way inside. 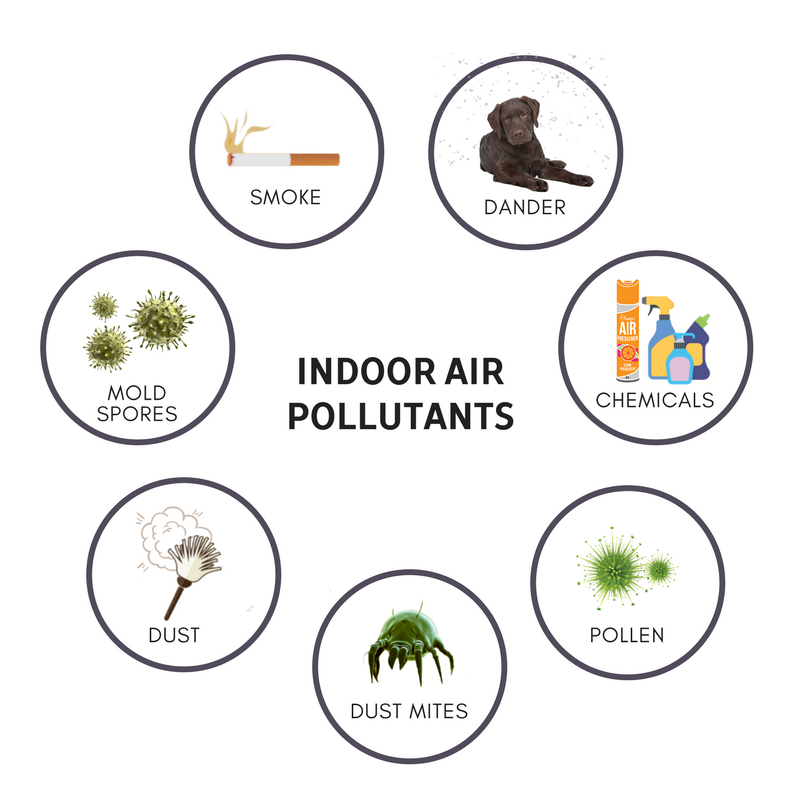 For other common respiratory triggers — like mold, pet dander, tobacco smoke, dust mites and volatile organic compounds (VOCs) — the air space within a sealed environment can provide a safe haven and even increase their overall longevity. For example, mold is a common, year-round allergen. It can be found inside indoor environments like homes, schools, vehicles, and office buildings. Because it thrives in moist atmospheres, places like bathrooms, kitchens, and laundry areas are popular breeding grounds. Animal dander is another oft-seen trigger. Despite what many believe, the animal’s fur is is not the allergen — it’s the dander that the animal secretes (mainly through saliva) and releases. Even if you don’t have an animal, you’re likely not immune from coming into contact with dander on a daily basis. It’s everywhere! Dust mites are another problem for clean air enthusiasts. Why? For one thing, they’re a bit omnipresent: you can find it everywhere from flat surfaces in your home like a desk or bookshelves, to bedding and pillows, to the very air you breathe. In addition to acting as major triggers to asthmatics, dust mites can also trigger a runny nose, itchy eyes, and coughing for people who don’t have asthma. Like mold, dust mites require moisture to survive, so the American Academy of Allergy, Asthma and Immunology recommends keeping the relative humidity below 50% in order to reduce the growth of dust mites. Those are just the biological indoor air pollutants. 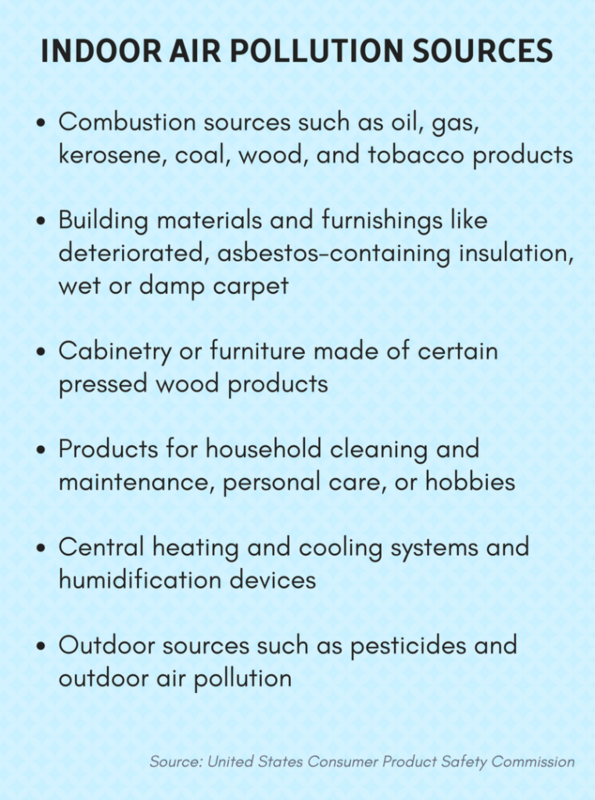 Additionally, there are chemicals that are brought indoors — whether intentionally or not — that can pollute an air space. A report released by the American Federation of Teachers noted that certain insulation materials can emit formaldehyde, an irritating and sensitizing chemical. Adhesives, carpeting, pesticides, copying machine and cleaners can also off-gas irritating or toxic organic compounds into an indoor atmosphere. In fact, many things designed to make your indoor air smell better — like candles and room fragrances — are often a huge source of pollutants due to the chemicals and irritants they contain. Neighborhood Energy Connection, a nonprofit organization that provides energy conservation information, says on their website that if you regularly burn candles or incense during the winter, the smoke, chemicals and soot released can have a hard time escaping from tight, well-insulated homes. This can result in stained walls and ceilings, and can have negative impacts on your indoor air quality. Getting serious about detoxing your air quality is a multi-layered approach. First, there are things you can do, depending on how much control you have over your indoor space. If you’re in a large office building, your options are more limited than if you’re talking about the air inside your own home. After that, you can take a proactive approach to cleaning up your air quality with technology. Concentrate on ways to collect and remove the allergens from your home (and thus your air), and ways in which you can treat the existing air inside your home. First, consider using a great vacuum — which is not only capable of removing dirt, debris and dust from your floors and soft surfaces, but is outfitting with a sealed HEPA filter so that microscopic particles aren’t re-released back into the air. After you physically remove what contaminants you can, a high-quality air purifier can be a great addition. Air purifiers that use a combination of better-than-HEPA filtration, ionization and germ-neutralizing technologies can make a huge difference in the air quality of a home, both in the way it smells and how it affects the people breathing it. Freshening air using technology instead of synthetic chemicals is a great way to detox your indoor space. If you enjoy scented things, consider placing few drops of essential oil onto a cotton ball, and placing it in corners where you’d like a fresh scent.